AMNESTY International says there is “strong evidence” Israel committed war crimes in Gaza following the capture of a soldier by Hamas in last year’s war. Its report says at least 135 civilians were killed in a bombardment of Rafah after Lt. Hadar Goldin was seized on August 1. He was later declared dead. 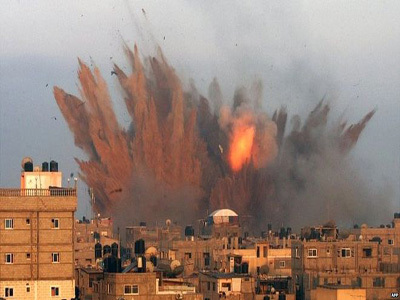 Amnesty said Israel employed a “‘gloves-off’ policy with devastating consequences for civilians”. Israel dismissed the report as “fundamentally flawed” and one-sided. On the Palestinian side, 2,251 people, 1,462 of them civilians, were killed, the United Nations says. On the Israeli side, 67 soldiers were killed along with six civilians. Amnesty’s report says Israeli actions in the Rafah area between 1 and 4 August 2014 might amount to war crimes and crimes against humanity. Its study was carried out with the Forensic Architecture, a research project specialising in spatial analysis, at Goldsmiths’ College in London. The investigation used advanced techniques, including analysis of shadows and smoke plumes, as well as testimony from Palestinian civilians. Lt. Goldin was captured after his unit came under fire from Hamas militants, and was dragged into a tunnel. The Israeli military invoked an order known as the Hannibal Directive, unleashing massive firepower to try to prevent Hamas from taking Lt. Goldin hostage. Amnesty said the implementation of the directive “led to the ordering of unlawful attacks on civilians”. It said 75 children were among those killed. Did any Isreali civilian die thorugh the assault of Palistinians during the conflict? Is it possible to rule out unexpected casualty during war?